The System x3100 M5 single-socket tower server is designed for small businesses and first-time server buyers looking for a solution to improve business efficiency. It delivers several innovative features with a competitive price, either in a compact mini-tower form factor, or standard tower form factor with hot-swap power supplies and disk drives. This product guide provides essential pre-sales information to understand the x3100 M5, their key features and specifications, components and options, and configuration guidelines. This guide is intended for technical specialists, sales specialists, sales engineers, IT architects, and other IT professionals who want to learn more about x3100 M5 and consider its use in IT solutions. Withdrawn from marketing: The models covered in this product guide are now withdrawn from marketing. The replacement system is the Lenovo ThinkServer TS460 (E3-1200 v6) which is described in https://lenovopress.com/LP0602. The x3100 M5 is now withdrawn from marketing. 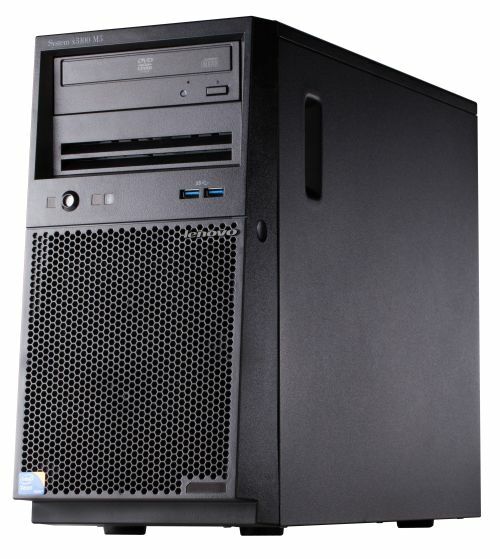 The replacement system is the Lenovo ThinkServer TS460 (E3-1200 v6) which is described in https://lenovopress.com/LP0602. The System x3100 M5 single-socket tower server is designed for small businesses and first-time server buyers looking for a solution to improve business efficiency. It delivers several innovative features with a competitive price, either in a compact mini-tower form factor, or standard tower form factor with hot-swap power supplies and disk drives. The System x3100 M5 has a compact design with flexible configuration options, built-in security, and systems management capabilities. It leverages the next-generation dual-core and quad-core Intel Xeon processor technology. The System x3100 M5 server is a compact, cost-effective, single-processor tower or rack-mountable server that has been optimized to provide outstanding availability, manageability, and performance features to small-to-medium-sized businesses, retail stores, or distributed enterprises. It supports the Intel Xeon E3-1200 v3 “Haswell” family of processors for applications that require performance and stability, and Core i3, Pentium, and Celeron processors for applications that require lower cost. The system includes features that are not typically seen in this class of system, such as standard, embedded RAID 0 and RAID 1, remote control capabilities even when the machine is powered off, and Predictive Failure Analysis (PFA) on processor and memory. 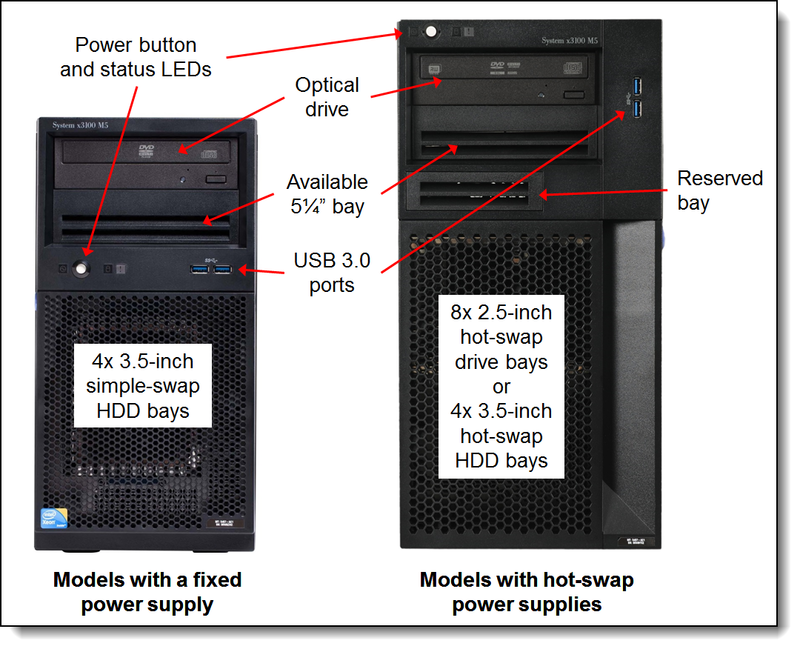 Some models also support hot-swap redundant power supplies and hot-swap disk drives. Often, small-to-medium sized businesses (SMBs) have limited IT budget and resources, and rely on partners or multitalented employees to help manage the company’s network. Business needs for efficiency improvement and retention of critical data require the usage of a server that is easy to get up and running quickly and is dependable. You need to squeeze as much as possible out of your IT dollars while saving costs on features that are not needed in an SMB environment. The System x3100 M5 is an ideal first server to meet those business needs. It was built for speed, yet eliminates costly design features that are found in general-purpose servers that are unnecessary for smaller businesses. The single-socket x3100 M5 supports the quad-core Intel Xeon Processor E3-1200 v3 ("Haswell") family of processors, which offer impressive computing power in a space-saving mini-tower design. Choice of processors with up to four cores to enable the effective usage of multi-threaded applications. Intel Xeon E3-1200 v3 processors supported by the server (with the exception of E3-1220 v3) support Intel Hyper-Threading Technology and Intel Turbo Boost Technology 2.0 to maximize performance. Up to 32 GB of high-speed DDR3 system memory with four DIMM sockets. Memory speeds up to 1600 MHz. Four available high-performance PCI Express 3.0 or 2.0 slots. Up to four internal 3.5-inch simple-swap or hot-swap SATA II HDDs on some models offer low-cost/high-capacity storage. Integrated ServeRAID-C100 software RAID controller supports RAID 0, 1, and 10. Hardware RAID options are available. Seven USB ports, two USB 3.0 on the front and four USB 2.0 on the back. In addition, there is one internal port for use with a tape drive or RDX Removable Disk Cartridge drive. ECC memory provides error correction that is not available in PC-class “servers” that use parity memory. Avoiding system crashes (and data loss) because of soft memory errors can mean greater system uptime. Tool-less cover removal provides easy access to upgrades and serviceable parts, such as CPU, memory, and adapters. Hot-swap drive bays that are available on some models combined with RAID capabilities offer the potential of no downtime in the event of a drive failure. The Predictive Failure Analysis (PFA) detects when system components (for example, processors, memory, and hard disk drives) operate outside of standard thresholds and generates pro-active alerts in advance of possible failure, therefore increasing uptime. Built-in diagnostic tests using Dynamic Systems Analysis (DSA) Preboot speeds up troubleshooting tasks to reduce service time. One-year customer replaceable unit and onsite limited warranty, next business day 9x5. Optional service upgrades are available. Integrated Trusted Platform Module (TPM) 1.2 support enables advanced cryptographic functions, such as digital signatures and remote attestation. Intel Xeon Processor E3-1200 v3 family supports Industry-standard Advanced Encryption Standard (AES) NI support for faster, stronger encryption. The Intel Execute Disable Bit function can help prevent certain classes of malicious buffer overflow attacks when combined with a supporting operating system. Available 350 W power supply, 300 W 80 PLUS Bronze certified power supply, or 430 W hot-swap 80 PLUS Silver certified power supply. With the addition of the Operating Temperature Enhancement Kit, the server supports the ASHRAE A3 standard, which means the server can operate in temperatures as high as 40°C. This means potential savings in environmental cooling costs. The Intel Xeon processor E3-1200 v3 product family offers significantly better performance over the previous generation while fitting into the same thermal design power (TDP) limits. The x3100 M5 is available in two different tower designs: a compact tower with a fixed power supply and simple-swap drive bays, or a standard tower with hot-swap power supplies and hot-swap drive bays. Figures 2 and 3 show the front and rear of the x3100 M5. Figures 4 and 5 show the locations of key components inside the server. Compact tower (can be a 4U rack form factor using the optional Tower-to-Rack Conversion Kit, 69Y5182). Standard Tower (can be a 5U rack form factor using the optional Tower-to-Rack Conversion Kit, 00J6353). One 2-core Intel Celeron Processor 2.8 GHz and 1333 MHz memory. One 2-core Intel Pentium Processor up to 3.4 GHz and 1600 MHz memory. One 2-core Intel Core i3 Processor up to 3.7 GHz and 1600 MHz memory. One 2 or 4-core Intel Xeon E3-1200 v3 up to 3.7 GHz & 1600 MHz memory. Supports EM64T for 32-bit and 64-bit operating systems and applications. Up to 2 MB for Intel Celeron processors. Up to 3 MB L3 for Intel Pentium processors. Up to 4 MB L3 for Intel Core i3 processors. Up to 8 MB L3 for Intel Xeon E3-1200 v3 processors. Chip set Intel C222, formerly known as Intel Lynx Point PCH and Intel Denlow platform. Memory DIMM slots Four DDR3 DIMM slots supporting UDIMMs. RDIMMs are not supported. Memory capacity Up to 32 GB with 8 GB DDR3 UDIMMs and four populated DIMM slots. Maximum internal storage Compact tower: Up to 8 TB with 2 TB 3.5" simple-swap NL SATA HDDs. RAID support Software RAID 0, 1, or 10 with ServeRAID C100 controller, upgradeable to RAID 5. Optional hardware RAID with ServeRAID H1110 (RAID 0, 1, 1E, or 10) or M1115 (RAID 0, 1, 10, optional RAID 5, or 50) or M5110 (RAID 0, 1, 10, optional 5, 50, 6, or 60, and optional cache with flash backup). Additional upgrades for M5110. For compact tower: using the hardware RAID adapter also requires a RAID upgrade kit (00J6352). Optical drive bays One 5.25" HH bay, support for DVD-ROM or multiburner. Half-High SATA DVD-ROM or multiburner included in standard models (model specific). Tape drive bays One 5.25" HH bay, support for DDS, RDX, or LTO drive. Network interfaces Integrated two-port Gigabit Ethernet (Broadcom BCM5717). One port is shared with the Integrated Management Module (IMM). Ports Front: Two USB 3.0 ports. Rear: Four USB 2.0, one DB-15 video, one DB-9 serial, two RJ-45 Gigabit Ethernet network ports (one dedicated and one shared with the IMM2 management processor). Internal: One USB 2.0 port for internal USB tape drive. Cooling Compact tower: Up to two speed-controlled non-redundant fans. A second fan is required if two or more adapters are installed (Thermal Solution Fan kit, 46W9177, optional). Optional Operating Temperature Enhancement Kit, 00Y8197, to enable the server to operate in a 40°C environment. Standard tower: Up to two speed-controlled non-redundant fans. A second fan is required if two or more adapters are installed (Thermal Solution Fan kit, 00Y8200, included in standard models). Optional Operating Temperature Enhancement Kit, 00FK940, to enable the server to operate in a 40°C environment. Power supply Compact tower: One fixed (non-hot-swap) power supply, model dependent: Either 300 W ac 80 PLUS Bronze power supply or 350 W ac power supply. Standard tower: Up to two 430 W hot-swap 80 PLUS Silver redundant power supplies. Hot-swap parts Compact tower: None. Standard tower: Disk drive bays and power supplies. Systems management UEFI, Integrated Management Module II (IMM2), basic light path diagnostic tests, Automatic Server Restart, IBM Systems Director, and ServerGuide. Optional IMM Advanced FoD Upgrade for remote presence (graphics, keyboard and mouse, and virtual media). Video Matrox G200eR2 with 16 MB memory that is integrated into the IMM2. Maximum resolution is 1600x1200 at 75 Hz with 16 M colors. Security features Power-on password, administrator password, and Trusted Platform Module. Limited warranty One-year customer replaceable unit and onsite limited warranty with 9x5/ next-business-day (NBD) response time. Service and support Optional service upgrades are available through Lenovo Services: 4-hour or 2-hour response time, 8-hour fix time, 1-year or 2-year warranty extension, remote technical support for hardware and some Lenovo and OEM software. TopSeller and Express models are preconfigured with additional components, such as processors, memory, and disks with the purpose of making the ordering and installation process simpler. 5457-EAx Core i3 4150 3.5GHz 3MB 1600MHz 2C (54W) 1x 4 GB 1600 MHz C100 4x 3.5"
5457-EBx Xeon E3-1220 v3 3.1GHz 8MB 1600MHz 4C (80W) 2x 8 GB 1600 MHz C100 4x 3.5"
5457-ECx Xeon E3-1220 v3 3.1GHz 8MB 1600MHz 4C (80W) 1x 8 GB 1600 MHz C100 4x 3.5"
5457-EDx Xeon E3-1220 v3 3.1GHz 8MB 1600MHz 4C (80W) 1x 8 GB 1600 MHz C100 4x 3.5"
5457-EFx Xeon E3-1231 v3 3.4GHz 8MB 1600MHz 4C (80W) 1x 8 GB 1600 MHz C100 4x 3.5"
5457-K1G Core i3 4150 3.5GHz 3MB 1600MHz 2C (54W) 1x 4 GB 1600 MHz C100 4x 3.5"
5457-K2G Xeon E3-1220 v3 3.1GHz 8MB 1600MHz 4C (80W) 1x 8 GB 1600 MHz C100 4x 3.5"
5457-K4G Xeon E3-1231 v3 3.4GHz 8MB 1600MHz 4C (80W) 1x 8 GB 1600 MHz C100 4x 3.5"
5457-K3G Xeon E3-1220 v3 3.1GHz 8MB 1600MHz 4C (80W) 1x 8 GB 1600 MHz C100 4x 3.5"
The following table lists the Express and TopSeller models with standard tower form factor (hot-swap HDDs and power supplies) that are available in certain regions. The server supports only one processor, which is already installed in all standard and Express models. No additional processor options are available. The following table lists all processors that are available in standard models of x3100 M5 or through configure-to-order (CTO). If there is no corresponding where-used model for a particular processor, then that processor is only available through the CTO process or special bid. † No additional processor options are available. The server supports only one processor, which is already included in a standard or custom configuration. The x3100 M5 has four DIMM slots, and only DDR3 ECC UDIMMs are supported. The CPU has two memory channels, and there are two DIMMs per channel. Configuration rules: If you plan to install more than one DIMM, then the DIMMs must be installed in a pair, and both DIMMs in a pair must be identical in type and size. The following table lists the memory options that are supported by the server. 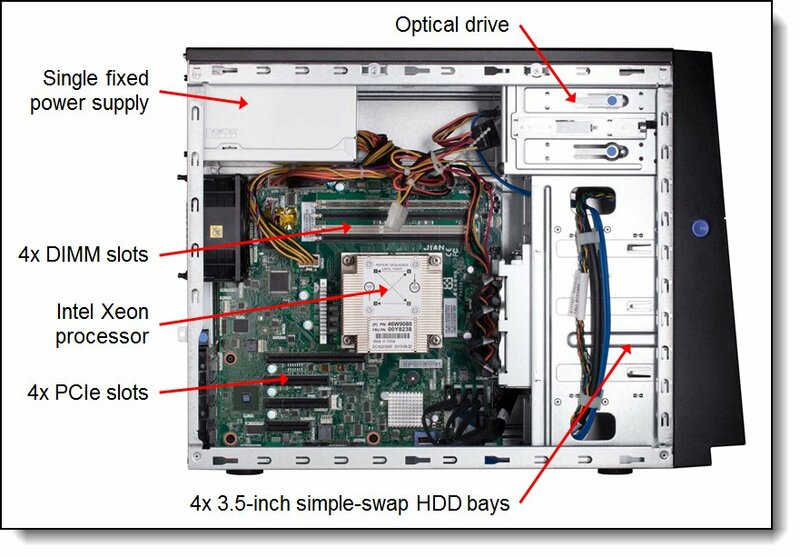 Models of the x3100 M5 with the compact tower form factor (and either a 300 W or a 350 W fixed power supply) support up to four 3.5-inch simple-swap SATA hard disk drives, as shown in the following figure. 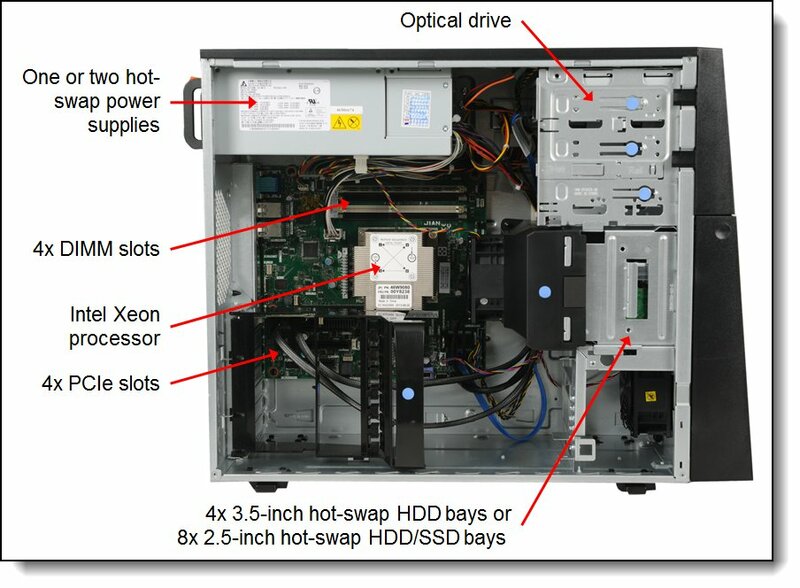 Models of the x3100 M5 using the standard tower chassis (and with hot-swap 430 W power supplies) support either up to eight 2.5-inch hot-swap drives or four 3.5-inch hot-swap drives, as shown in the following figure. The following table lists the RAID controller and internal HBAs that are supported by the server. The following table lists the supported upgrades to the internal RAID controllers and HBAs. * A cache option (81Y4484, 81Y4487, or 81Y4559) must be selected. ** For the standard tower chassis only (hot-swap power supplies). Not supported in the compact tower chassis. The following table lists chassis upgrades for RAID controllers. The drives supported depend on the chassis selected. 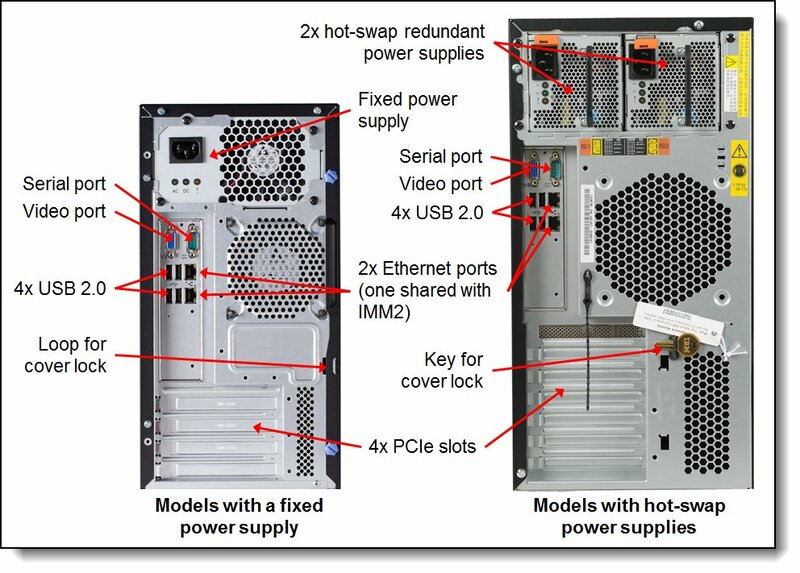 The x3100 M5 with the compact tower form factor (and either a 300 W or a 350 W fixed power supply) supports 3.5-inch simple-swap hard disk drive options that are listed in the following table. 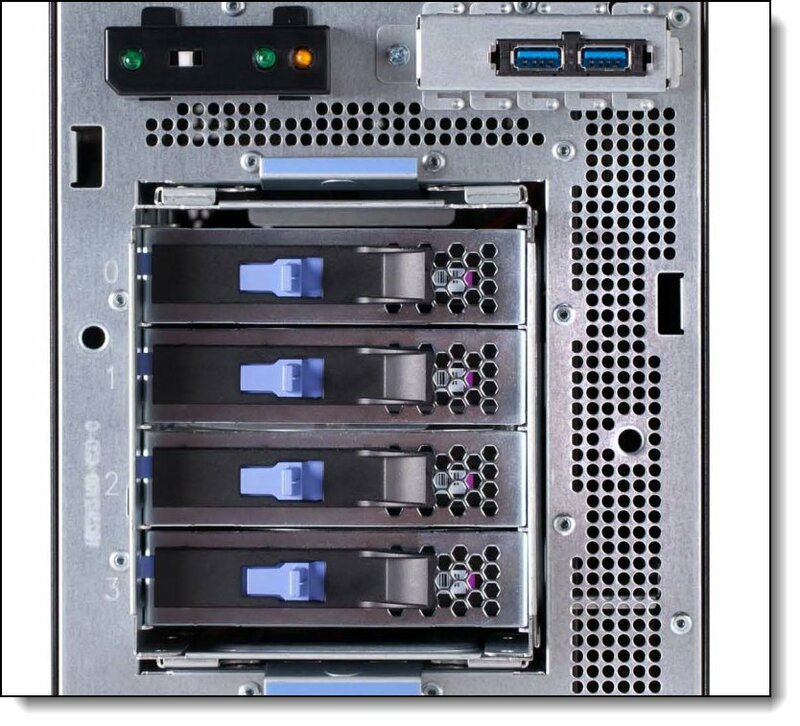 The standard tower chassis (and with hot-swap 430 W power supplies) supports the 2.5-inch and 3.5-inch drive options drives listed in the following two tables. Hot-swap SATA HDDs and hot-swap SAS HDDs can be intermixed, but not in the same array. The following tables list the supported 2.5-inch hot-swap HDDs and SSDs. The following tables list the supported 3.5-inch hot-swap HDDs and SSDs. The server supports the internal tape drive options that are listed in the following table. Internal tape drives are installed in a 5.25-inch HH bay. A maximum of one tape drive is supported. SAS tape drives require an internal SAS HBA to be installed in server. USB tape drives are connected to the dedicated USB tape drive connector on the system board. The server supports the optical drive options that are listed in the following table. * This option is only available through CTO or is already installed in standard models. The server offers four PCI Express expansion slots. The form-factors of available slots are as follows. This applies to both the compact tower chassis and the standard tower chassis. * Require SFP+ optical transceivers or DAC cables that must be purchased separately. See the following table. The following table lists the supported 10 Gb Ethernet SFP+ optical transceivers and DAC cables. For multi-port adapters, all adapter ports must have the same type of transceiver or DAC cable selected. The following table lists the supported SAS HBAs and RAID adapters. * The ServeRAID M5100 Series Battery Kit (81Y4508) is supported only with ServeRAID M5100 Series 512MB Cache/RAID 5 Upgrade (81Y4484). † The ServeRAID M5100 Series RAID 6 Upgrade (81Y4546) requires a cache upgrade (either 81Y4484, 81Y4487, or 81Y4559). The following table compares the supported adapters. The following table lists the Fibre Channel host bus adapters (HBAs) supported by x3100 M5 server. The server does not support PCIe Flash Storage Adapters. Compact tower models either come with a single fixed 350 W ac power supply or a single fixed 80 PLUS Bronze 300 W ac power supply. There are no additional power supply options. Standard tower models offer one or two hot-swap 430 W ac power supplies, which are 80 PLUS Silver certified. For models with only one power supply, the part number to order a second power supply is listed in the following table. Two power supplies that are installed form a redundant pair. The above option does not ship with a power cord. Standard models and some TopSeller models ship with power cords but some TopSeller models do not ship with power cords. See the Express and TopSeller models section for details. The following table lists country-specific line cords and rack power cables that can be ordered, if needed. Both the compact tower design (with a single fixed power supply) and the standard tower design (with hot-swap power supplies) come with one or two speed-controlled non-redundant fans, model dependent (see Table 2). The second fan is required if two or more adapters are installed, and the fan is configured by selecting the appropriate Thermal Solution Fan Kit, as listed in the following table. If you want to operate the server in an environment up to 40°C (104°F), use the optional Operating Temperature Enhancement Kit that is listed in the table. This kit contains an additional thermal sensor. The server contains Integrated Management Module II (IMM2), which provides advanced service-processor control, monitoring, and an alerting function. If an environmental condition exceeds a threshold or if a system component fails, the IMM2 lights LEDs to help you diagnose the problem, records the error in the event log, and alerts you to the problem. Optionally, the IMM2 also provides a virtual presence capability for remote server management capabilities. Important: The onboard ServeRAID C100 RAID controller is not supported by virtualization hypervisors, including VMware vSphere (ESXi), Linux KVM, Xen, and Microsoft Hyper-V. The server has a one-year warranty with 24x7 standard call center support and 9x5 Next Business Day onsite coverage. Also available are Lenovo Services warranty maintenance upgrades and post-warranty maintenance agreements, with a well-defined scope of services, including service hours, response time, term of service, and service agreement terms and conditions. Lenovo warranty service upgrade offerings are country-specific. Not all warranty service upgrades are available in every country. The server supports the rack cabinets that are listed in the following table. One of the tower-to-rack conversion kits is required for the server to be installed in the rack.